This interesting and unusual surname is of Anglo-Saxon origin, and is locational from two places so called, in the West Riding of Yorkshire and in Nottinghamshire. The placenames are derived from the Old English pre 7th Century personal name 'Hafoc', hawk, and the Old English 'worth', enclosure, settlement, and means 'Hafoc's settlement'; the personal name may have been given to a person who had some resemblance to a hawk. The place in Yorkshire was first recorded as 'Hafecesweorthe' in the Early Yorkshire Charters of circa 1030, and the place in Nottinghamshire was first recorded as 'Hochesuorde' in the Domesday Book of 1086. The early recordings of the place in Nottinghamshire may be explained by postulating Scandinavian interference, form the Anglo-Scandinavian form of the personal name 'Hauk'. Locational surnames were developed when former inhabitants of a place moved to another area, usually to seek work, and were best identified by the name of their birthplace. The surname is mainly found in Yorkshire. Among the sample recordings in Yorkshire are the marriages of Christopher Hawksworth and Jennet Maud on August 21st 1552 at Halifax, and of Arthur Hawksworth and Sarah Beldon on June 11th 1644 at Emley. 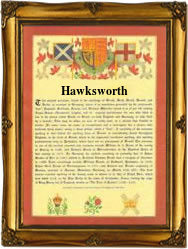 The first recorded spelling of the family name is shown to be that of Johannes de Haukesworth, which was dated 1379, The Poll Tax Records of Yorkshire, during the reign of King Richard 11, 'Richard of Bordeaux', 1377 - 1399. Surnames became necessary when governments introduced personal taxation. In England this was known as Poll Tax. Throughout the centuries, surnames in every country have continued to "develop" often leading to astonishing variants of the original spelling.